1. You have already created your account, But have not yet activated it. If this is the reason, then you need to go to your registered Email ID and check your Inbox/Spam folder. Just Click on ‘Activate My Account’ on your mail. Username and Password should not be same. 3. Accept Term & Conditions during creating account/ during Checkout procedure. By default, the StudyByTech app is set so that it only downloads content, including videos, if you are on a Wi-Fi network. If you change this setting, you might exceed the data allowance for your cellular plan. Scroll the side menu, select My Settings. 2. Change the Wi-Fi only download setting. While playing classes, I am not able to view videos, only IMEI and LAN ID is visible. What should I do? c) Your app is not properly installed. b) Now press ‘app info’, which gives 2 options-‘force stop’ and ‘uninstall’. e) Now again Re-login to our app. If still the issue is unresolved, feel free to write to us at contactus@studybytech.com, we will be happy to help you. How do I watch Offline download videos? In your course, navigate to the video or to the section of the course that contains the video you want to download. You can find videos in the course outline under Course, or find all the videos in the course under Videos. 2. Select the download icon for an individual video to download a single video, or the download icon for a subsection to download all the videos in that subsection(as given in below image). You can see the download button changed to downloading sign as given in below image. When a video completes downloading, the next process is Saving of video. The combined process takes around 10-15 minutes for approx. 1 GB video and is shown till this green line remains on the screen. After you downloaded a video, you can watch it at any time, just keep in mind that you need to be online for approx. 1 minute at the start of the video for tracking and then go offline. 2. Play your desired download classes from the downloaded classes. Important: For offline download, we need to have at least twice empty internal storage space on the device than the size of the video. “Your device does not have enough space to download the class“. Kindly keep in mind that in download process double storage space is required in internal memory. Therefore, for a class of 1 GB we should have at least 2 GB of free internal memory. You can delete downloaded videos one by one or, if you have downloaded all the videos in a course subsection, you can delete all of a subsection’s videos at once. In your course, navigate to the downloaded video(from My Downloads) or to the subsection containing the videos you want to delete. 2. Press the Edit button at the bottom of the screen, which provides 2 options- Cancel and Delete. 3. Select the videos which you want to delete by ticking mark the box present in front of the videos. 4. Then press Delete button at the bottom of the screen, as given in above image. How Can a Student Ask Queries? Teachers provide their contact no. and email ID to students in the first class. Students can directly discuss his/her queries with the teacher. You can review the concept if you feel that concept is not fully understood. But be sure that you use it wisely as we are tracking your used minutes. Alternatively, a discussion box is provided in every course. The student can write their queries in such discussion box. 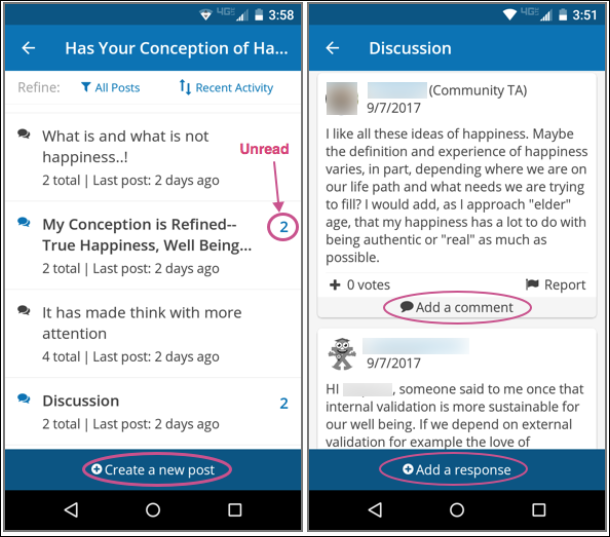 How do I post questions on the discussion board in the app? You can read and contribute to course discussions using the StudyByTech app whenever you have an internet connection. In your course, select Discussion. At the top level of course discussions, you see categories of posts created by course staff, usually organized based on course structure. Within each category, you see lists of posts by learners. Each post has indicators to show the number of comments and responses the post has received. The number of unread comments for a post is shown until you have viewed a post. When you view individual posts, you can add a comment or a response, or upvote a post. Posts by community TAs or course staff have a role indicator next to their username. Update shows a new section is added in course, but I am not able to see it. What to do? Long press the StudyByTech icon> press app info. 2 options will come- Uninstall and Force Stop. Press Force Stop. Now again login to our App. Which android version is compatible with StudyByTech app? StudyBytech app is compatible with all android devices with version 4.2 and above. iOS version of our app is under development stage and soon will get launched. I am unable to find the update button on Google playstore while my app is showing an alert to update the app. What am I suppose to do? In certain devices, you might find that on opening our app, there is an update but on clicking the update button you land over google play store page where only 2 options are there -Uninstall and Open. If this is the situation with you, then just kill this page of Google play store by pressing back button and reopen Google play store from the icons of the mobile device. Then search for our app there where you will get Update button by clicking on our app StudyBytech. Hope this article is helpful for you all! Through website– Step 1-Go to our website-www.studybytech.com, click on the Courses button. This will take you all courses. Now, click on the course you want to get enrolled to and then click on Enroll now button. Step 3- Then tick mark on- I agree on StudyByTech terms & conditions and press Checkout button. 2. Through Mobile application– Step 1- Go to Find courses and then select the course you are interested in. Step 2- Click on the button- Add to cart. Step 3- Now you will be landed over ‘Subscribe Now’ button, where you have to tick mark on- ‘I agree to all terms & conditions’ and then click on the checkout button. How do I post questions on the discussion Forums? You can read and contribute to course discussions using the StudyByTech app whenever you have an internet connection. In your course, select Discussion. After enrollment to the course, how to access the course videos? After you enroll in a course, you find it listed under My Courses in the main menu. Open a course to access the main course screen. Course– Access course content including videos, organized based on the course outline. Videos– Download or stream course videos, organized by course sections. Discussion– Read and make posts in course discussions. Handouts– Access any documents shared by the course team, such as the course syllabus or special reading material. Announcements– Read a welcome message or course update messages from the course team. Course Progress– To find out the total no. of hours and no. of hours left. StudyByTech (SBT) was conceptualized to help CA students save the most precious resource – Time. We do that by converging the rigor of face to face classroom with the fun of on-demand-virtual classes. Our services include live and recorded classes by some of the best CA faculty across the country. Our classes run only on Android Mobile and Tablet. All you need is to download the app from android app store now. For iPhone lovers, Apple store launch will be scheduled soon. So hang in there! © 2019 StudyByTech. All rights reserved.